Today’s post comes from Melis Edwards, author of Deep End of the Pool Workouts: No-Impact Interval Training and Strength Exercises — and you might recall that she shared a great pool workout with us last year. Melis has more than 30 years of experience as a running and triathlon coach, personal trainer, fitness instructor and athlete, and has participated in Ironman distance triathlons as well as the Western States 100-mile endurance run. She holds a Master’s Degree in Health Promotion, a Bachelor’s in Health Education, and several teaching and training certifications. And she’s got some great tips for workouts runners can do to overcome common injuries. Runners like to run — plain and simple. From trails to city streets, races to social runs, they look forward to their feet hitting the ground. I have been a coach, trainer and athlete for years and I can tell you, the kiss of death for a runner (or really any passionate athlete) is an injury. Runners hear the words “no running” and cannot imagine what they’ll do instead. This leads to what I have seen over and over again through the years — people running on injured body parts when they shouldn’t. I seen runners limping from plantar fasciitis or an ankle sprain, bent over with poor posture from tight hips or weak core muscles, bands strapped on their knee suffering from iliotibial band syndrome or patellar chondromalacia, you name it. What gives? Do they not know how to rehabilitate properly? Or are they so set in their ways that they are not open to other possibilities? On multiple occasions I’ve suggested an injured athlete crosstrain or work with a physical therapist and been met with skepticism. Well, I used to be a skeptic, too. I thought I could work out my injuries without assistance. However, over time and injuries/accidents, I realized I could heal faster and stay injury-free longer with the right assistance. So, if this is remotely sounding familiar to you or someone you know, consider entering the world of water training. It’s a serious mode of rehab and cross training for any sport, but especially for runners because it can help strengthen and stretch a runner’s body with low (or no) impact. In deep water, the runner experiences a complete open kinetic chain motion with zero impact to joints, and even in shallow water, the buoyancy means that ground force trauma is far less than with land-based movements. I’ve listed a few of the most common running injuries I see, along with the workouts I suggest for rehab. Your first step, though, should be to consult with your physical therapist or doctor so they can guide you to exactly what you should do on your own. Then, you can ask them about pool training as a rehab choice. I co-authored my book (Deep End of the Pool Workouts ) with a physical therapist (and amazing friend of 30 years), Katalin Wight, and these workouts have her approval. An ankle sprain can take a few days to many weeks of rehab. 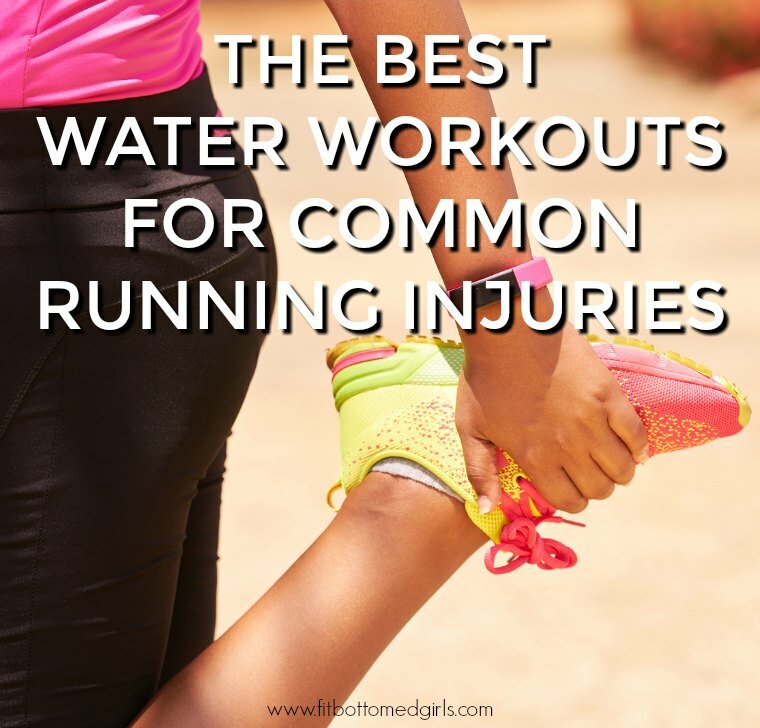 You’ll experience pain, swelling, instability in walking, so being in the water with little to no joint impact can help you get back into the running game. Try: Hopping. Hopping in the shallow-end of a pool will help with getting the ankle strength back. Remember, the more underwater your body is, the more buoyant you become, so start your hops when you are in the pool at about chest level (or about 70 percent buoyant). Perform the hops one foot at a time with a straight leg, but soft knee joint — the power shouldn’t come from your knees, and instead, rely on your ankle/calf by using ankle plantar flexion to hop straight up and out of the water a few inches then allow the foot/ankle to dorsiflex fully to land back to a flat foot. Next step: The higher you hop out of the water, the more ankle flexion comes into play. If the rehab is going well, try hopping from side to side to work the medial and lateral ligaments. Start off with light hops, as the lateral motion will put more force out the medial and lateral aspects of the ankle region. As your ankle strength improves, you can increase the effort by moving into more shallow waters or hopping at different angles. Suffering from plantar fasciitis (PF) means the tissue on the bottom of your feet are inflamed, and you can experience anything from weakness to debilitating strains. PF can last for a few weeks or for much longer, and it’s often worse in the morning, feeling better as you move throughout the day. Try: Water Running. Use of the deep end of the pool and a hydro belt to ensure you are keeping your body perpendicular with the floor of the pool and with your head just above the water’s surface. In addition, the belt will allow you to control your efforts. When water running, your legs move through a full running stride, but it works your muscles very differently than on land. It promotes flexibility of the ankles and works the calves, both areas in need of attention when addressing plantar issues. Water running. Credit: John Winnie, Jr. If you have piriformis syndrome, you may have experienced tightness/pain of this small muscle on your upper aspect of your gluteal region. When inflamed, it can aggravate the sciatic nerve. If you’re suffering IT band syndrome, you might feel a slight tightness on the outside side of the knee, which goes away once you start running. Tight hips and hamstrings — which often come paired with back pain — are common complaints among runners, especially those who sit at work all day. These injuries are lumped together because the rehab that can be done in the pool for all of them can be similar. The one difference is that, if you’re dealing with more hip/back pain, you’ll want to slow the movements down and emphasize the stretch and mobility rather than power of the exercise. Try: Water Walking. As with the water run mentioned above, the following strokes require the use of the deep end of the pool and a hydro belt . Water walking promotes full torso engagement, hamstring strength and flexibility, and engages the gluteal muscles especially for the outward swing of the leg. Think of a water run, but rather than have the leg move directly beneath the body, the leg moves from that same forward lengthened position and migrates laterally in a short arc to finish almost in the same spot a regular run would finish (behind the runners body). The muscles of the hamstrings and glutes should power the movement and the leg movement is countered with the upper body and arm swing on the opposite side. Water walking. Credit: John Winnie, Jr. Try: Cross Country. The cross country is another broad, sweeping stroke which can open the hips, increase range of motion while building strength in the quads, hamstrings, abductors and piriformis. The Cross Country is a reciprocal stroke, with the leg movement forward being equidistant and balanced with the leg movement to the rear. When the leg moves to the forward stroke, this promotes hip flexion and quad strength, a slight dorsiflexed foot working the tibialis anterior and stretching the calves, and lengthening the hamstrings. When the leg moves to the rear position, the hips are extending with the gluteals engaged.